Modèles personnalisables. Vendent des images ! J'EMBARQUE DANS LE MONDE ENTIER. 对于中国请注意, 作为最常见的邮件发送正常邮件失去 我非常建议注册的邮件 (有条件的运输选项). ДЛЯ РОССИИ ПОЖАЛУЙСТА, ОБРАЩАЙТЕСЬ, Я ВЫСОКО РЕКОМЕНДУЕТ ЗАРЕГИСТРИРОВАННУЮ ПОЧТУ (ЭКСПЕДИРОВАННЫЙ ВАРИАНТ ПЕРЕВОЗКЫ ГРУЗА) КАК САМЫЕ ИЗДЕЛИЯ ОТПРАВЛЯТЬ РЕГУЛЯРНЫЙ ПОЧТОВЫЙ ПОЛУЧЕНИЕ ПОЛУЧИТЬ ПОТЕРЮ. Item and held till 15th October 1945. Sent back 1946 to Honfleur. Odd WW2 cover. Cheques in Sterling. And Happy hunting. 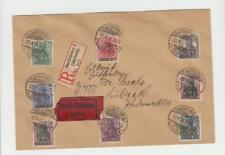 Lithuania Sc#157(pair)#152(block of 6-reverse) PANDELYS 4/IV/1923 to USA, see reverse. Colombie tout. Yv 245(2), Air 64. 4 cents bleu, partenaire et 30 Bleu. YV 245 (2), air 64. 4 bleu, couple et 30 cents bleu gris. CALI à PARIS (France). Shows signs of age and wear along with smudges, scuffs, scratches, crinkles, creases, tears, and discoloration. What you see is what you get. You buy it, you own it. Cook Yv 76/85. Série Completa. Yv 76/85. 1949-complete series. Yv 66/68. série complète de 1954. Grèce Yv 66/68. Série toutes. Local Yv. Série complet (Type II). (MiI/IV II 12. 1939-complete series (type II). ). 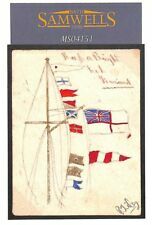 GELBER HUND Rhein and Main Flight Official Card and 1M Gelber Hund overprint on 10pfg stamp Darmstadt 19/6/12. Urbana, Oh 43078. 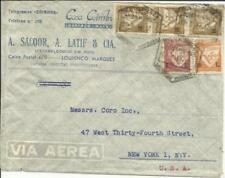 Nouvelle annonceUSA POSTAL HISTORY. 1978, US ARMY IN PARIS stamp. 1978, US ARMY IN PARIS stamp.included history card. Modèles personnalisables. Vendent des images ! J'EMBARQUE DANS LE MONDE ENTIER. 对于中国请注意, 作为最常见的邮件发送正常邮件失去 我非常建议注册的邮件 (有条件的运输选项). 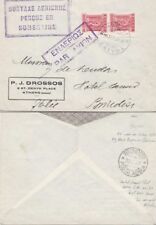 Greece 1938 Cover to Sydney, Australia.